So Reese’s Puffs are nothing new, they’ve been around for about twenty years, but admittedly I don’t eat them all that often. I can probably count on one hand the number of times I’ve actually eaten them, and last time I did was probably in high school. I recall not liking them very much. So I figured I’d give them another shot since they were on sale recently; maybe my adult tastes have become a bit more receptive of this blatant kid’s cereal, who knows. Hell, look at the back of the package for the box I have. Even the little bonus game things on the back are hip-hop themed. 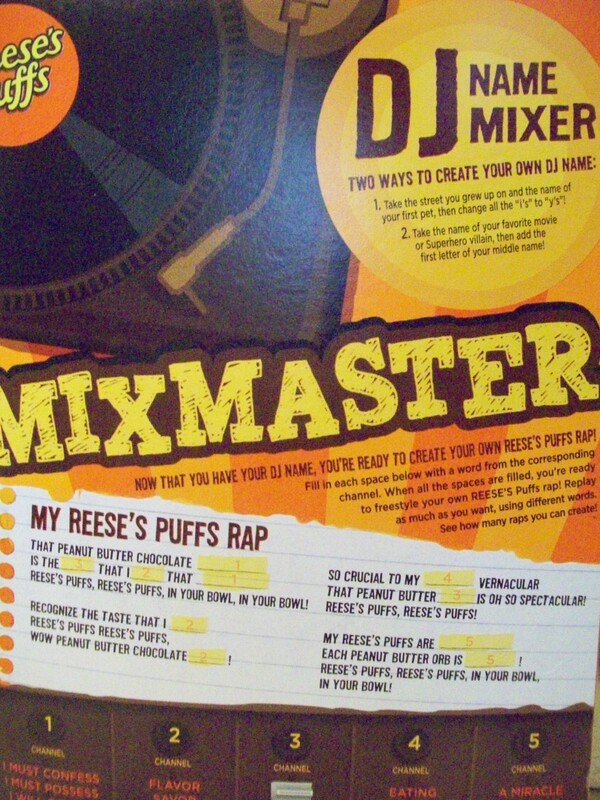 So according to this my DJ name would either be Lexyngton Felyx, or Shredder C. You can all look forward to my upcoming single ‘MY REESE’S PUFFS FT. FLO RIDA && BUSTA RHYMES’. 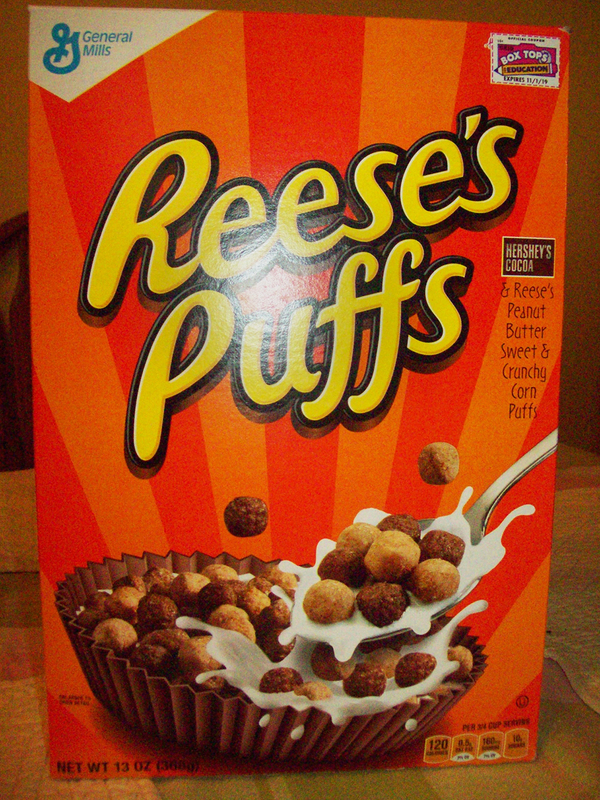 Anyway as mentioned, obviously Reese’s Puffs are a combination of chocolate and peanut butter corn cereal puffs. Interestingly enough, when they first created the cereal they were known as “Reese’s Peanut Butter Puffs”, and to the best of my knowledge didn’t play up the fact it contained Hershey’s cocoa powder. Now the box explicitly mentions it. To be honest, you can’t even really tell, so eh whatever. Based on that I assume the cereal was originally more peanut-butter focused, though I honestly don’t remember eating it when I was only 6 years old. It definitely tastes like peanut butter and some chocolate, but I don’t know if I would exactly claim that it’s “Reese’s, for breakfast”. They say that it uses Reese’s peanut butter, but to be honest the cereal just tastes exactly like Cap’n Crunch’s Peanut Butter Crunch. I honestly wouldn’t be surprised if they two came out of the same machine, then just rides along into separate boxes. The puffs, like Cap’n Crunch, stay crunchy in milk for a lonnnng time, which is both a pro and a con. If you pour yourself a bowl, then walk away and get sidetracked watching episodes of Transformers Robots In Disguise while paying credit card bills, it’s a pro, since the cereal will be a perfect crunch level for you to eat with little effort. However, if you hit the snooze button six times and jump out of bed, throw some cereal in a bowl and slam it down your throat in under a minute, while the rough, gritty nature of it tears apart your pharynx on the way down, then it’s a con. There’s a happy middle ground in there, but definitely don’t choose this cereal if you’re in a rush in the morning. 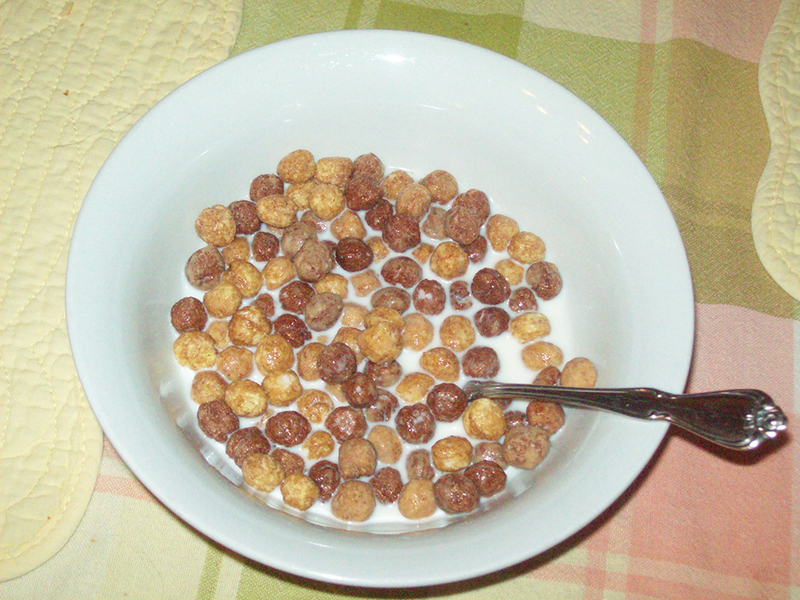 The cereal milk it leaves over is actually the only defining part of Reese’s Puffs. Whereas it tastes mostly and feels exactly like Peanut Butter Crunch, the resultant milk you get from Reese’s Puffs does actually taste a little bit different. And it’s good, too. It still doesn’t taste like ‘zomg candy bars 4 brakefaste’, but the added hint of chocolate does make it taste better than other peanut butter cereals’ milks. Nutrition-wise, it’s your average, sugary kid cereal, no healthier or unhealthier than others. All that said, the cereal milk really isn’t THAT much to make you choose it over regular Peanut Butter Crunch, unless it happens to be the cheaper option for the week. It’s not bad by any stretch of the imagination,it’s just that Cap’n Crunch is so common and virtually on-sale every single week at different supermarkets, that it doesn’t really pay to bother with a more expensive cereal just for the addition of a slight chocolate taste. Should you eat Reese’s Puffs? Want to try it for yourself? Follow our Amazon Associate link! Posted on July 16, 2015, in The Snack Report and tagged breakfast, cereal, CHOCOLAAAATE, peanut butter, review. Bookmark the permalink. 1 Comment. 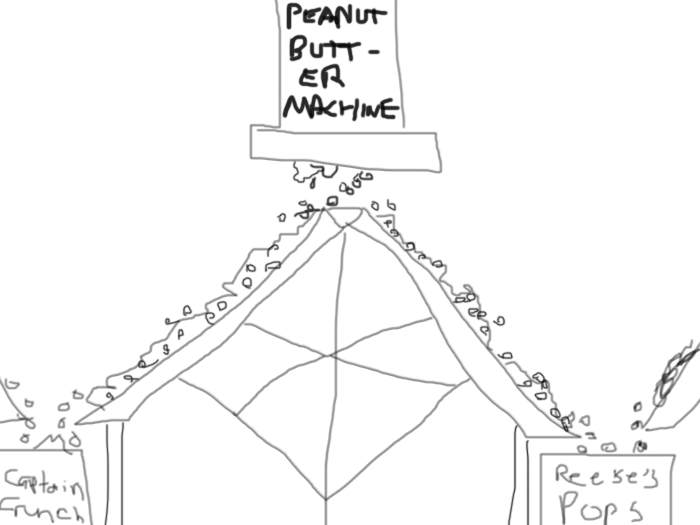 Maybe one day there’ll be a How It’s Made or Unwrapped episode about Reese’s Puffs and we can find out if your diagram is correct, Shredder C.